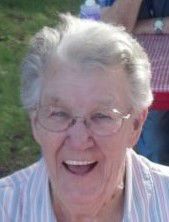 Doris Amanda (Lystad) Drake, 92, loving wife, mother, sister, aunt, grandmother and great grandmother, passed away on January 30, 2019 at home where she loved to be. Doris was born on August 11, 1926 in Peerless, Montana to William Walter Lystad and Bertha Amanda Berg. She had three brothers and one sister. Doris was so smart she skipped a grade in school and graduated from high school at 16 years of age as the Valedictorian. She attended one year of college at Northern Montana College in Havre, Montana. Doris soon met the love of her life, William George Drake, on a ranch in Scobey, Montana. At eighteen years of age, they married on January 22, 1945, just as Bill went into the Marines to fight in WWII. Bill and Doris raised a family of eight children, numerous grandchildren and great grandchildren. Their marriage was a happy one which lasted 64 great years until November 21, 2009, when Bill passed away. Doris was a stay at home Mom who worked on farms and ranches throughout her life. She was known to drive tractors, ride horses, chase cows, raise and butcher chickens, and other daily tasks on the farm. She sold milk, eggs and worms for extra money. We called it the Tilly Fund after our cow. Once the Tilly Fund had enough money, Bill and Doris took whichever kids were at home out to a real restaurant for dinner. Doris worked as an East Helena school bus driver for years and worked 20 years at the State Nursery in Helena, Montana. Doris and Bill were crafty in their retired years, which she enjoyed. She could sew, crotchet, paint, chop wood, win nail driving competitions, toss bales of hay, sheer sheep, and plant and harvest vegetables. She had a good sense of humor, liked peppermint schnapps and was a member of the Good Sam Camping club. Doris is survived by all eight of her children, Alice Realing (Howard), Clark (Marie-deceased), Larry (Susan), David (Penny), Richard (Lorrie), Diane, Bob (RoseAnn), and Susan (Dale) Doane. She is also survived by numerous grandchildren, great grandchildren, her niece Bonnie Lystad Hall, her great nephew Mitch Hall, Ray’s wife Ella Lystad, Brittney Lystad, Ryan (Kaitlin) Lystad, her nephew Don (Diane) Lystad, Kristen Lystad, Megan Lystad Anderson, Erik Lystad and surrogate sister, Delores Hart. Doris was preceded in death by her precious husband, Bill, her father, William, mother Bertha, sister Alice, her brothers, Marvin, Melvin (Bud) and Maynard, her nephews Raymond & Ralph Lystad, her great niece, Neysa, her nephew Joe Lystad, her daughter-in-law, Marie Drake, and grandson, Scott Garrison. Doris lost her mom on December 15, 1929. She and her brothers and sister were farmed out to family members in Minnesota until her Dad could bring them home to Montana to stay. Doris grew up without a Mom during hard times including the great depression. At 11 years old, her sister, Alice, was in effect, a mother to Doris and Bud. With help from the community, Doris grew up to be the strong, determined and independent woman we all knew and loved. Doris was the glue which kept her family together no matter the circumstances. She was tough, strong, stubborn, the disciplinarian, comforter and, you know the saying, “You’re a good cook Doris” it was coined for her. Most of all, she was a loving wife, mother, grandmother and friend. Doris was a good woman who loved Charlie Pride’s music. She and Bill met Charlie Pride at the local Lakeside Bar, and she also saw Charlie Pride live many times at the Host Fest in North Dakota. It was good she enjoyed music because she and Bill would cut the rug every chance they got. Man could they dance! In Eastern Montana, they would take a horse and sled with hay bales as seats for Doris and the kids. One time the sled hit a bump and Doris flew off. The snow was so deep, Bill brought the sled around so Doris could run and jump on. They would go to the community center and dance the night away. Doris loved spring when the trees are blooming, sun is shining and the grass is green. So to honor her love of spring and keeping with Drake family’s love of picnics, a celebration of life barbeque and pot luck will be held at her home at 5733 Drake Road, East Helena, Montana, on Saturday, May 11, 2019, at 2:00 p.m.
HOHN, Inez, R., age 94 of Townsend passed away Saturday, February 2, 2019. Viewing will be held from 9:00 a.m. to 2:00 p.m. on Friday, February 8th at Anderson Stevenson Wilke Funeral Home, 3750 N. Montana Ave in Helena. Graveside services will be held at 3:00 p.m. on Friday, February 8th at the Montana State Veterans Cemetery at Fort Harrison. A memorial service celebrating Inez's life will be held at 2:00 p.m. on Saturday, February 9th at the Townsend United Methodist Church, 200 North Cedar Street in Townsend. A reception will follow the service in the fellowship hall of the church. Please visit www.aswfuneralhome.com to offer a condolence to the family or to share a memory or Inez. SHADOAN, Mauna, age 92 of Townsend, passed away on Saturday, January 26, 2019. The family will receive friends today, February 4th from 10:00 a.m. to 10:45 a.m. with a funeral service to begin at 11:00 a.m., at The Church of Jesus Christ of Latter-day Saints, 916 Broadway St. in Townsend. Burial will follow the funeral service at Deep Creek Cemetery. A reception will follow the burial in the fellowship hall of the church. Please visit www.stevensonwilke.com to offer the family a condolence or share a memory of Mauna. SHADOAN, Mauna, age 92 of Townsend, passed away on Saturday, January 26, 2019. The family will receive friends on today, February 3rd from 5:00 p.m.to 7:00 p.m. at The Church of Jesus Christ of Latter-day Saints, 916 Broadway St. in Townsend. The family will also receive friends on Monday, February 4th from 10:00 a.m. to 10:45 a.m. with a funeral service to begin at 11:00 a.m. on Monday, February 4th at The Church of Jesus Christ of Latter-day Saints, 916 Broadway St. in Townsend. Burial will follow the funeral service at Deep Creek Cemetery. A reception will follow the burial in the fellowship hall of the church. Please visit www.stevensonwilke.com to offer the family a condolence or share a memory of Mauna. VICKERS, Jaclyn M., age 72, of Helena, passed away on Wednesday, January 30, 2019. A memorial service will be held at 11:30 a.m. on Friday, February 8th at Helena First Assembly of God Church, 2210 Dodge Ave. with a reception to follow in the social hall of the church. Memorials in honor of Jacklyn are suggested to Hospice of St. Peter’s Health, c/o St. Peter’s Health, 2475 Broadway, Helena, MT 59601. Please visit www.aswfuneralhome.com to offer the family a condolence or to share a memory of Jaclyn. KNUTSON, Clifford N. “Cliff”, age 72 of Helena, passed away Saturday, January 19, 2019. A Graveside Service with Military Honors is scheduled for 11:00 a.m. Friday, February 8, 2019 at the Montana State Veterans Cemetery, Ft. Harrison. A Reception will follow the burial at Our Redeemer's Lutheran Church; 3580 N. Benton Ave in Helena. The family suggests memorials in Cliff’s name go to the Lewis & Clark Humane Society, 2112 Custer Ave., Helena, MT 59602. Please visit www.aswfuneralhome.com to offer a condolence to the family or to share a memory of Clifford. WETHERELL, Michael "Mike" K., age 81, of Helena, passed away Thursday, January 31, 2019. A celebration of his life will take place 2:00 p.m.to 5:00 p.m. Sunday, February 10th at Yatson Restaurant, 22 W Main St in East Helena. In lieu of flowers the family requests donations in Mike's name be made to the Hospice of St. Peter’s Hospital c/o St. Peter’s Hospital, 2475 Broadway, Helena, MT 59601. Please visit www.aswfuneralhome.com to offer the family a condolence or share a memory of Mike. WENSEL, Tyler J., age 21 of Winston, passed away January 28, 2019. A memorial service will be held at 11:00 a.m. on Saturday, February 16th at the Church of Jesus Christ of Latter-day Saints, 916 Broadway Street, in Townsend. A reception will follow the service in the fellowship hall of the church. In lieu of flowers, memorial donations may be made to Tyler Wensel’s Go-Fund-Me page. Please visit www.stevensonwilke.com to offer the family a condolence or share a memory of Tyler. Born for adventure, Tanner Scott Jackson began to weave his meandering tapestry of life on January 27, 1981, in Rock Island, Illinois. He journeyed forth without fear or regret, unconcerned with earthly constraints; his singular obsession locked on the ethereal vision painted in his mind. Although he died on his 38th birthday, January 27, 2019, after a decades-long battle with depression, the ripples of exuberance created by his existence continue to be felt. All who knew Tanner will be forever blessed by that connection. After moving to Bozeman, Montana, as a young child, Tanner began his love relationship with the Mighty Mountain. He and his two brothers spent their youth in the woods, hiking, camping, skiing, climbing, and backpacking. As the boys got older, they continued to explore together, adding biking, ice-climbing, and paddle-boarding to their repertoire. They rode bicycles coast to coast across the U.S., climbed, hiked, and skied most of the highest peaks in the West, and had many other wilderness adventures in unnamed places off-trail. These experiences filled and defined Tanner’s life. No matter the trip — be it a months-long expedition or a simple outing to a park to play pickleball — Tanner was leading the way. He was a thoughtful and meticulous planner; his imagination for new climbing routes and ways of moving through the world were unrivaled; his enthusiasm for being on the leading edge (or watching and cheering others on as they led) was infectious. If you were scared, he would go first; if you needed encouragement, he had your back; if you were learning, he was a patient teacher; if you nailed it, he was your biggest cheerleader. In short, if you had Tanner on your team, you were already a winner, regardless of the outcome. Tanner was a young man when his twin sisters were born. His passion for adventure was contagious and he gently passed along his love of skiing, climbing, and rafting to them at a very early age. He showed them the rewards of taking good risks and pushing themselves, helping mold them into the strong young women they are today. Children were a bit of an enigma to Tanner, but he never hesitated when engaged with them. He always treated them as the beautiful little humans they were and they responded, as many of us did when meeting Tanner: with awe, excitement, and joy. For this and many more reasons, he was similarly adored by his niece and nephew. Tanner grew up in Helena, Montana, graduated from Helena High School in 1999, and attended the University of Montana in Missoula. Always a free-thinker, his love of writing, reading, and creating art were cultivated through his experiences in school and matured over years of great conversations, intense practice, and a tireless pursuit of truth. Tanner thoroughly enjoyed intellectual challenges and engagement, but it was with his sweet spirit and big heart that so many people connected. He saw the world with the eyes of a poet: a sunset could stun him, a hoarfrost-covered branch caught his eye, a world of paradoxes engaged him and compelled him to respond. As Tanner’s intrepid spirit led him around the world in search of new experiences, his curiosity and drive led him to continually push his creative and physical boundaries. Tanner was truly larger than life and being close to him was like riding a rollercoaster that you never wanted to get off. Sometimes it was scary. Sometimes it was thrilling and made you feel things you never expected. Most of the time it was just plain fun. Regardless, for all who were lucky enough to have had a ticket, it was the ride of a lifetime. Tanner was preceded in death by his grandfather, Donald Jackson, and his grandmother Wilma ‘Honey’ Crase. Tanner is survived by his parents, Scott Jackson (Lisa) of Missoula, Montana, Claudia Crase (Ric Blevins) of Gallatin Gateway, Montana; siblings, Kyle (Lindsay Selser), Logan, Anja, and Rane; niece and nephew, Willa and Boone (children of Kyle and Lindsay); grandmother, Jean Jackson and grandfather, Claude Crase (Barb); and a huge, crazy, and adoring extended family of aunts, uncles, cousins, and true friends. Although our hearts are broken by the loss of our beautiful boy, we find some comfort knowing that Tanner ALWAYS knew he was very, very loved and cherished. Our family is grateful to all who have expressed condolences and shared touching memories and hilarious stories. In lieu of flowers (or any other material items), those wishing to honor Tanner can consider a donation to the Bozeman Help Center at www.bozemanhelpcenter.org or to the Southwest Montana Mountain Bike Association at www.southwestmontanamba.org. And if you want to feel close to Tanner, go outside and have an adventure! A celebration of Tanner’s life will take place from 1:00 to 4:00 on Saturday, February 9, 2019 (with a toast beginning at 1:30), at the Kleffner Ranch near Helena (www.kleffnerranch.com). Please join us! Clifford (Cliff) N. Knutson passed away on January 19, 2019 in Yuma, AZ of a heart attack at the age of 72. He was born on January 17, 1947 to Malfred and Anna Knutson of Big Sandy, MT where he lived until being drafted into the US Army. Cliff served in the Vietnam War for one year and relocated to Helena upon his discharge. He attended the Helena Vo-tech and earned a degree in carpentry. He married Catherine Strizich on August 22, 1970. He spent 18 years with Yuhas Millwork and 15 years with the Helena School District #1 until his retirement at age 55. Cliff enjoyed fishing, hunting, camping, spending time with his grand kids, and wintering in Yuma, AZ. Cliff is survived by his wife of 48 years, Cathy; his daughters, Sarah (Mike) Magee of Helena and Holly (Donny) Holmlund of Helena; his sister, Dora Mahood of Great Falls, MT as well as his four-legged friend Sophy. He is preceded in death by his parents and two sisters, Dorothy Geier and Delores Courtnage. A Graveside Service with Military Honors is scheduled for 11:00 a.m. Friday, February 8, 2019 at the Montana State Veterans Cemetery, Ft. Harrison. A Reception will follow the burial at Our Redeemer's Lutheran Church; 3580 N. Benton Ave in Helena. The family suggests memorials in Cliff’s name go to the Lewis & Clark Humane Society, 2112 Custer Ave., Helena, MT 59602. Please visit www.aswfuneralhome.com to offer a condolence to the family or to share a memory of Clifford. On the morning of January 27, Nancy Wanda Wornath, age 80, went to be with her Lord and Savior, Jesus Christ, following a month-long illness. Nancy was born in Malta, MT to Vern Pete Misner and Mikeal Terese Howard, the youngest of four children. She was raised in Lewistown and Zortman before settling in Great Falls where she attended local schools. Nancy married and divorced several times, but was blessed with two daughters and two sons from these marriages. Nancy married Robert Wornath in Great Falls on June 5, 1976 and soon after both she and Bob gave their lives to Christ. They moved to Helena in 1977 where she was a homemaker, professional housekeeper and a telephone fundraiser throughout the years. She always felt one of her greatest achievements was raising several million dollars for Right to Life while working at Treasure State Development. Nancy became involved in Prison Fellowship Ministries in Helena following the murder of her youngest son and was known to many as “Grandma Angel Tree” during the years she ran Project Angel Tree each Christmas at the mall. She later became a victims’ advocate for Victim Witness Assistance Services. She enjoyed camping, fishing and going to weekly garage sales with her husband in the summers. Nancy developed many health problems later in life, but her love for her Lord, her family and friends was always evident despite her hardship. She was preceded in death by her parents, siblings and youngest son, Jack Parsons. She is survived by her husband and daughters, Mikeal (Gary) Hajek of Great Falls, and Melody Lundquist of Helena; and son, James (Sandra) Lundquist of Great Falls. She is also survived by grandchildren, Stephen Hajek of Whitefish; Tyson (Laura) Hajek, Brittany (Chris) Barrett and Crystal (Dennis) Skinner, all of Great Falls; great-grandchildren Maverick Hajek, Kamryn King, Braydon & Brody Barrett and Sawyer Skinner. She is also survived by a niece, Medora Starr Azure of Great Falls; and many “adopted” children, grandchildren and great-grandchildren. James A. Mitchell, 85, passed away unexpectedly of a heart attack on January 23, 2019 in Quartzsite, Arizona. He and his wife Dorothy had spent winters there for the past 20 years to get out of the cold in Montana. Jim was born in Independence, Oregon to Richard and Ellen (Keller) Mitchell, the second of seven children. They moved back to Montana when Jim was still a baby. Jim graduated from Stevensville High school, where he lettered in several sports. After high school he joined the Army where he became a Ranger and paratrooper with the 11th Airborne. Jim was working for the Butte-Anaconda and Pacific Railroad when he met his wife Dorothy while dancing at the IT Club outside of Butte in Rocker. They were married in Shelby, Montana on May 29, 1958, and celebrated their 60th anniversary last year. They had three children, Jim, Steve, and Laurie – all two years apart. Jim managed the Hennessey store in Livingston, and then transferred to the new Helena store. Deciding to go into business for himself, he became half owner of H & M Equipment Company selling farm machinery. He later bought the King Koin Laundromat. Jim went to Alaska on a vacation and decided that if you could make money floating around on the ocean, “that was the life!” Dorothy and Jim fished commercially in Southeast Alaska for 20 years. They loved every minute of it! Jim was an avid hunter and fisherman, who got his antelope last fall at the age of 84. His younger brother Lonnie helped him pack it out. The fish in Hauser Lake are relieved even though the family is sad! His life was richly blessed by the Lord. He loved being with his family, dancing and playing cards and games. Not a day went by that he wasn’t busy. Jim is survived by his wife Dorothy, son Jim (Michelle) Mitchell, son Steve (Sheri) Mitchell, and daughter Laurie (Pat) DeLong and five of his siblings. Jim had four grandchildren and six great grandchildren who loved him dearly. He was preceded in death by his parents and his brother Larry Mitchell. There will be a memorial service held at a date to be announced. It is with great sadness that the family of Debbie Muir Grebenc announces her passing on Sunday, January 28, 2019 after a long and brave fight with cancer. Born in 1968 in Edina, Minnesota and raised in Napa, California, Debbie moved to Montana in 1992 and eventually settled in Helena in 1999. Debbie worked in the information technology industry for 30 years, but her passion was swimming. She swam collegiately at St. Olaf College, and throughout her years in Helena she taught swim lessons and coached people of all ages. Debbie also volunteered for organizations such as the YMCA where she served on the Board of Directors. She is survived by her husband Jerry, daughters Halley and Elsa, and a large extended family. A celebration of Debbie’s life will be held late in the spring or early summer of 2019 and friends and family will be notified well in advance. In lieu of flowers etc., memorial donations in her name can be made to the Prickly Pear Land Trust, PO Box 892, Helena, MT 59624. Ralph C. Van Daele, age 81, died January 26, 2019 at home from complications of Cancer. He was born in Helena. He was the youngest of seven children born July 28, 1937 to Mary and Andrew Van Daele. His first job was working with Eddie Barbeau at Avalanche Kennels. Later he served in the Army Infantry stationed in Alaska. Following his Military Service, he was employed by the Federal Reserve in Helena as their first Computer Programmer. He was employed 21 years at the Federal Reserve. He was married and he and his wife Judy had four children. When he retired from Federal Reserve he became self-employed as “The Best Damn Handyman around”. He was instrumental in setting up the water system for the MacHaffie site, working with archeologists. He was always tinkering and repairing things like antique cars. His whole garage was filled with motors that he was always fixing. As his daughter said he was a true renaissance man. He was always available to help others anytime night or day. He was just a phone call away. He was a devout Catholic. He was an Usher at the St. Helena Cathedral. He was in charge of the Offerings and welcomed new members. Ralph was preceded in death by his parents, Mary and Andrew Van Daele, siblings, Bea Hash, Howard Sarbu, Irma McGill, Andy “Ned” Van Daele, Kenny Van Daele. Ralph is survived by children Tresa, Clayton, Donald, Damon; Grandchildren, Tyzer Cady, Amber, Arial and Camus Van Daele; one sister Wilma and many nieces and nephews. He is also survived by special friend Joy Park and her family. Special thanks to his many long-time friends Greg Gardner, John Finstad and family, Jamie Near, Pam Bompart, Ed Mohler and many more. Nancy Patricia (Pat) Allen, 90, passed away peacefully from natural causes on January 25, 2019, at Beehive Homes of Helena. Pat was born to Sarah and Archie Carter on September 18, 1928 at the Carter Ranch homestead, in the Lone Pine Hills of Ekalacka Montana. Pat spent many treasured hours of her childhood riding for miles in the Lone Pine Hills on her beloved horse “Molly”. During the school year she stayed with her Grandmother in town. In those early days there were no school buses and it could mean a 10 mile walk in deep snow and frigid weather to get to school. She spoke often about the times she spent with her Grandmother as being some of the best moments of her life. Pat moved with her family to Albany Oregon in 1942 and attended Albany High School. She held various jobs while living in Albany. Two of her favorite jobs were cashiering at the local movie theatre and working the soda fountain at the Payless Drug store. This is where she met her future husband the love of her life, Glenn Louis Allen in 1949. Glenn had recently graduated from the University of Oregon with a business degree and served in the US Navy during WW II where he was a Lieutenant stationed in Hilo, Hawaii. They married in 1952 and moved to Portland Oregon in 1958 to begin a new career in the Long-term care industry. Pat and Glenn owned several long-term care facilities in the Portland, Oregon area. In 1972, the Allen’s built and started the first Retirement home in Portland. This is where Pat took on the role as the manager and ran the family business until 1993. The Allen’s were pioneers in the Long-term care industry by developing the concept of the “continuum of care” where the elderly could age in place. Pat moved to Helena in 2004 to be closer to her daughter and family. Gardening was a passion for Pat. Every year she would have beautiful Dahlias and vegetables abundant. She loved making zucchini bread for her family and neighbors. Pat also, enjoyed bowling, golfing, reading, fishing in Baja, and dancing (she once won a twist contest in the 60’s). She also enjoyed collecting ceramic clowns, hummals and plates. She would say “every clown has a different story to tell” and that is why she loved them. In the summer she would enjoy entertaining and having what she would famously call her “pool parties” with her family and friends. Pat was preceded in death by her sister (Carolie), brother (Ronald), father and mother and husband Glenn and son Charles (Chuck). Pat is survived by her daughter Gayla (Julian), daughter in law Tessie, grandson Colin and grand-daughters Sarah and Michelle. Pat will be laid to rest next to her husband Glenn and son Chuck at Willamette Cemetery in Portland Oregon. Isabel Barbara Iams was born on September 21, 1928 in Taylor, North Dakota, the daughter of Aaron Iams and Barbara Iams (nee Bader). Born the eldest of six, she helped her mother raise her siblings Lucille, Jeffery, Michael, Douglas, and Sarah. She continued to live in Taylor until her family moved to Billings, Montana. Isabel (though she preferred to be called Barbara, to her nieces and nephews she will always be "Aunt Isy") remained in Billings through her high school graduation. After her return to Billings, MT she met the love of her life Robert James Griffith. Robert was a member of the Montana Highway Patrol and frequently courted Barbara at the Muzzleloader, a popular Billings establishment. They were married on April 6, 1968 in a decidedly understated ceremony (the term "elopement" could be used without much question). They spent the first year of their marriage in Chicago while Robert (aka "Griff") attended Northwest University on a grant to receive his degree in Criminal Justice. In 1969 Robert was assigned to MHP HQ in Helena where they resided in a basement apartment on Knight Street. It was during their residence in this apartment that Barbara gave birth to her son, Patrick, at St. Peters Hospital on January 3, 1970. It was also during this time that Robert and Barbara decided to build a house in the far north Helena valley. While working to build their house Robert said, according to Barbara, "We can have a boat, a lake cabin, and nice cars...but it means we both have to work." Barbara said she replied "I'll stay home and raise the kid...who wants a damn boat anyway?" Barbara enlisted the help of her father and the couple’s friends to help with the house. The daughter of a carpenter, Barbara inherited the knack for woodworking, a trait which would constantly infuriate and befuddle her husband, though he made an almost inhuman effort to help. At the time few, if any, people were building that far out into the Helena valley. At one point they had to make an up-front payment for concrete because the concrete company could not believe "any idiots were building way the hell out there". It would be almost 2 years before the home they dreamed of was completed. Barbara and Robert then lived in that home for the next 30+ years, enjoying the view and raising their son. On April 1, 1994 Robert retired from the MHP as the longest serving law enforcement officer in the history of Montana. They then began their retirement years, which consisted of frequent "mini-vacations" in which Barbara would pick a small town in Montana; they would drive there and explore the area while simultaneously finding the best bars and restaurants. Given the nature of Montana, the bars were fairly easy to locate, the restaurants...kind of hit and miss! Another highlight of their retirement years was their annual trip to Las Vegas for the "Retired MHP Golf Tournament", at which they frequently met and played in the tournament with their son. They spent many hours conversing with their son and old friends at the various "Keno bars" on Freemont Street in downtown Vegas. On January 17, 2010 life changed for Barbara upon the passing of her beloved Robert. While she mourned the change, her spirit was undaunted and she decided to sell her home of almost 38 years and move to Texas to be closer to her son. A Montana/North Dakota girl at heart, she decided after 2+ years that the "big city" life of Dallas/Fort Worth was not for her and moved back to Billings, MT to be near to her siblings. After almost 3 years back in Billings, her wanderer’s spirit once again made itself known, and she returned to Texas for another 2 1/2 years. The majority of that time she resided with her son. They took frequent drives into the Texas countryside and had many dinner/lunch outings and visited many of the local "dive" bars (probably her favorite part of the trip, she did like a good Jack Daniels "Ditch"). Her desire for home and family showed through once again though, and she returned to Billings to once again be near her siblings. Unfortunately, a series of strokes and other health problems shortly after her return to Montana resulted in her residence at the Aspen Meadows facility in Billings. Barbara resided there until the end of her life, which occurred peacefully in her sleep. Many thanks to the staff of Aspen Meadows who kept watch over her when we could not. Barbara rejoined her beloved Robert in the early morning of January 27, 2019. While we will always miss her presence, we can take solace in that her suffering is over and she is at peace with her beloved. Isabel Barbara Iams Griffith was preceded in death by her parents Aaron Iams, Barbara Iams, brother Michael Iams (Grace), and husband Robert James Griffith. Jackie Vickers, age 72, passed away on January 30, 2019 due to an ongoing battle with cancer. Jackie was at home with her daughter Melissa, son Jim and faithful companion Munchkin by her side. Jackie was born in Seattle, Washington on February 10th, 1946. She attended school at Rainier Beach. In 1971 she and her children moved to Helena to be near her sister Donna and her children. In 1974 she married Rodger Vickers and they remained together until his death in 2001. During their marriage, they enjoyed camping and playing cards with friends and family. Jackie was an avid reader and loved watching old movies and taking road trips with her best friend Carin. She is reunited in death with her parents, Jerome and Frances Wachsmuth, her sister, Donna Thompson, and the love of her life, Rodger Vickers. She is survived by her brother, Raymond Wachsmuth of Pensecola, FL, children, Melissa (Alan) Loy, Jim (Aprill) Vickers; Grandchildren, Danielle (John) Cassidy of Martinez, CA; Tyler (Beth) Magill of Helena, Wren Vickers of Helena, Dayna (Adam) Colvin of Midland, MI and Shawn (Shaun) Carnahan of Bozeman, MT. Jackie was also blessed with great grandchildren, Grace, Isaiah, Taytum, Tayleigh Jaclyn, Gabrielle, Rylah and Madison. She leaves behind many cherished nieces and nephews and their families. A memorial service celebrating her life will be held at 11:30 a.m. on Friday, February 8th at Helena First Assembly of God Church, 2210 Dodge Ave. with a reception to follow in the social hall of the church. Memorials in honor of Jacklyn are suggested to Hospice of St. Peter's Health, c/o St. Peter’s Health, 2475 Broadway, Helena, MT 59601. Please visit www.aswfuneralhome.com to offer the family a condolence or to share a memory of Jaclyn. Michael Kale Wetherell (Mike) passed away on January 31st following complications from a stroke that he had suffered 11 years ago. He was born on 8/20/1937 to Maxine and Robert Wetherell while they resided in Mexico, Missouri. He was the youngest of four boys (brothers Robert, Thomas, and David). At a young age his family moved to Bozeman where he attended grade school, high school, and college. He was an excellent writer & worked on the student newspaper in his time at college. He earned a business degree from Bozeman and moved to Seattle to work as a real estate appraiser for FHA. Mike chafed at office work and eventually moved back to Montana to drive a truck. Owning and operating a small trucking company was a passion for Mike, he took great pride in having the cleanest trucks on the road and successfully operated his trucking company from 1966 until the time of his stroke in 2007. While trucking was both a hobby and a job for Mike he still cultivated several outside interests that included skiing, riding motorcycles, and classic cars. Mike grew up skiing at Bridger Bowl and continued to enjoy skiing all over the state with his family as he aged. Another early life interest was riding off-road motorcycles. He spent countless hours travelling the back country on motorcycles with friends and family. Mike was very proud of his cars and trucks, his 1940 Ford Coupe was the subject of an article in Hot Rod magazine and he often talked about mounting a receiver hitch to a Porsche in order to pull his motorcycle trailer. His hobbies & work resulted in a large circle of friends both near & far that he was very proud to have. Mike married Sally (Rauser) on 12/28/1973 and had two children, Kale (Sharlene) Helena, MT and Carrie Hogan (Kip) Nairobi, Kenya. Mike took great pride in being a great provider for his family. He was a devoted father and contrary to popular opinion was not as strict as he portrayed himself. He provided strong guidance as the patriarch of the family and will be sorely missed. Mike was preceded in death by his parent and brothers. He is survived by his wife, children, and grandchildren- Connor, Lauren, Jack, Sam, Ben & Charlotte. Our family would like to thank not only our friends & family that have supported us the 4 years that dad was at Apple Cooney Rehab but also the staff there & the St. Peter’s Hospice staff. We feel blessed that dad is finally at peace & free of the body he had been trapped in for the past 11 years. A celebration of his life will take place 2:00 p.m. -- 5:00 p.m. Sunday, February 10, 2019 at Yatson Restaurant, 22 W Main St in East Helena. In leiu of flowers the family requests donations in Mike's name be made to the Hospice of St. Peter’s Hospital c/o St. Peter’s Hospital, 2475 Broadway, Helena, MT 59601. Please visit www.aswfuneralhome.com to offer the family a condolence or share a memory of Mike. HOPKINS, Dr. Richard “Rich” age 74, of Helena passed away Friday, February 1, 2019. Services are pending at this time and will be announced when they are complete. Please visit www.retzfuneralhome.com to offer a condolence to the family or to share a memory of Rich. SHADOAN, Mauna, age 92 of Townsend, passed away on Saturday, January 26, 2019. The family will receive friends on Sunday, February 3rd from 5:00 p.m.to 7:00 p.m. at The Church of Jesus Christ of Latter-day Saints, 916 Broadway St. in Townsend. The family will also receive friends on Monday, February 4th from 10:00 a.m. to 10:45 a.m. with a funeral service to begin at 11:00 a.m. on Monday, February 4th at The Church of Jesus Christ of Latter-day Saints, 916 Broadway St. in Townsend. Burial will follow the funeral service at Deep Creek Cemetery. A reception will follow the burial in the fellowship hall of the church. Please visit www.stevensonwilke.com to offer the family a condolence or share a memory of Mauna. LITTLE, Ruth M., age 93, of Helena, passed away on Thursday, Jan. 24, 2019. A celebration of Ruth’s life will be held at 2 p.m. today, Feb. 1, at Anderson Stevenson Wilke Funeral Home, 3750 N. Montana Ave. A reception will follow in the social hall of the funeral home. A graveside service will be held at 2 p.m. tomorrow, Saturday, Feb. 2, at Sunset Memorial Gardens, 25373 Frontage Rd. in Bozeman. In lieu of flowers, memorials in honor of Ruth are suggested to Helena Food Share, P.O. Box 943, Helena, MT 59624-0943. Please visit www.aswfuneralhome.com to offer the family a condolence or to share a memory of Ruth. SHADOAN, Mauna, age 92, of Townsend, passed away on Saturday, Jan. 26, 2019. The family will receive friends on Sunday, Feb. 3, from 5 p.m.to 7 p.m. at The Church of Jesus Christ of Latter-day Saints, 916 Broadway St. in Townsend. The family will also receive friends on Monday, Feb. 4, from 10 a.m. to 10:45 a.m. with a funeral service to begin at 11 a.m. on Monday, Feb. 4, at The Church of Jesus Christ of Latter-day Saints, 916 Broadway St. in Townsend. Burial will follow the funeral service at Deep Creek Cemetery. A reception will follow the burial in the fellowship hall of the church. Please visit www.stevensonwilke.com to offer the family a condolence or share a memory of Mauna. VICKERS, Jacklyn M., age 72, of Helena, passed away on Wednesday, Jan. 30, 2019. A memorial service will be held at 11:30 a.m. on Friday, Feb. 8, at Helena First Assembly of God Church, 2210 Dodge Ave. with a reception to follow in the social hall of the church. Memorials in honor of Jacklyn are suggested to Hospice of St. Peter’s Health, c/o St. Peter’s Health, 2475 Broadway, Helena, MT 59601. Please visit www.aswfuneralhome.com to offer the family a condolence or to share a memory of Jacklyn. ANTILA, Daniel “Danny” R., age 48, of Elliston, passed away on Friday, Jan. 25, 2019. A funeral Mass will be celebrated today at 12 p.m. Thursday, Jan. 31, at the Cathedral of St. Helena, 530 N Ewing St. A graveside service will follow the Mass at Elliston Cemetery. A potluck reception will follow the burial at the Elliston School Gym, 205 W. Main St. Please visit www.aswfuneralhome.com to offer the family a condolence or share a memory of Danny. LITTLE, Ruth M., age 93, of Helena, passed away on Thursday, Jan. 24, 2019. A celebration of Ruth’s life will be held at 2 p.m. on Friday, Feb. 1, at Anderson Stevenson Wilke Funeral Home, 3750 N. Montana Ave. A reception will follow in the social hall of the funeral home. A graveside service will be held at 2 p.m. on Saturday, Feb. 2, at Sunset Memorial Gardens, 25373 Frontage Road in Bozeman. In lieu of flowers, memorials in honor of Ruth are suggested to Helena Food Share, P.O. Box 943, Helena, MT 59624-0943. Please visit www.aswfuneralhome.com to offer the family a condolence or to share a memory of Ruth. SHADOAN, Mauna, age 92, of Townsend, passed away on Saturday, Jan. 26, 2019. The family will receive friends on Sunday, Feb. 3, 2019, from 5 p.m to 7 p.m. at The Church of Jesus Christ of Latter-day Saints, 916 Broadway St. in Townsend, Montana. The family will also receive friends on Monday, Feb. 4, 2019, from 10 a.m. to 10:45 a.m. prior to services, also at the church. Funeral services will be held at 11 a.m. on Monday, Feb. 4, 2019, at The Church of Jesus Christ of Latter-day Saints, 916 Broadway St. in Townsend, Montana. A reception will follow the service in the fellowship hall of the church. Burial will be at the Deep Creek Cemetery in Townsend, Montana following the reception. Please visit www.stevensonwilke.com to offer the family a condolence or share a memory of Mauna. KNUTSON, Clifford N., age 72, of Helena, passed away Jan. 19, 2019, in Yuma, Arizona. A graveside service with military honors is scheduled for 11 a.m. Friday, Feb. 8, at the Montana State Veterans Cemetery, Fort Harrison. A reception will follow the burial at Our Redeemer’s Lutheran Church, 3580 N. Benton Ave. Please visit www.aswfuneralhome.com to offer the family a condolence or share a memory of Clifford. BANNON, Hud P., age 54, of Montana City, passed away Saturday, Jan. 26, 2019. A celebration of Hud’s life will take place 1 p.m. today, Jan. 30, at Anderson Stevenson Wilke, which falls on what would have been his 55th birthday. A reception will follow the celebration of life at the VFW, 117 W. Main St. in East Helena. Please visit www.aswfuneralhome.com to offer the family a condolence or share a memory of Hud. ANTILA, Daniel “Danny” R., age 48, of Elliston, passed away on Friday, Jan. 25, 2019. A vigil will be held 6 p.m. today, Jan. 30, at Anderson Stevenson Wilke Funeral Home, 3750 N. Montana Ave. in Helena. A funeral Mass will be celebrated 12 p.m. Thursday, Jan. 31, at the Cathedral of St. Helena, 530 N. Ewing St.. A graveside service will follow the Mass at Elliston Cemetery. A potluck reception will follow the burial at the Elliston School Gym, 205 W. Main St. Please visit www.aswfuneralhome.com to offer the family a condolence or share a memory of Danny. VOEGELE, Alice, age 56, of Helena, passed away Wednesday, Jan. 16, 2019. Graveside service will be held today, Jan. 30, at 10 a.m. in the Lewis and Clark County Cemetery. CLOUGH, Robert, age 69, of Helena, passed away Tuesday, Jan. 15, 2019. Graveside service will be held today, Jan. 30, at 10:15 a.m. in the Lewis and Clark County Cemetery. POLSON -- Peace. Hear me now. Upon this notice bear witness to the addition of the name of Wayne G. Buchanan to the Roster of Ancestors of the Clan Buchanan. The final page of the novel of his life was printed January 19, 2019. His passing was unassuming, without pain or violence and without prior notice. He simply went to sleep on the way to his sister’s. Plans of a night of good food, good wine, and good guitar playing with his cherished brother-in-law Paul, his sister Barbara, and his bride Carol were forever put on hold. Wayne was born in Chester, PA on July 29, 1939. As soon as his parents, Edwin and Dorothy, could deliver his 4 siblings they headed west at a breakneck pace to plant roots in the Great State of Montana where they all grew up in the town of Missoula. Early life was spent tormenting his sisters Diane, Barbara, and Judy. Brad, his younger brother was a favorite target. Brad paid him back by becoming Wayne’s best friend until his death in 2010. Wayne mourned Brad’s passing every day. At the age of 20 he married his high school sweetheart, Karen Lindh, and became a father to a daughter, Heather, and a son, Bruce. He graduated from UM and they spent the next few years moving from town to town while Wayne practiced his one true calling of becoming a truly spectacular teacher. Hunting and fishing were his favorite pastimes and would remain so his entire life. Eventually the family arrived in Helena and Wayne became involved in politics and education working for the Montana School Boards Assoc. After being its executive director for a number of years he decided to pursue a dream of achieving his Doctorate from the University of Virginia. Karen had other plans and headed to the opposite coast to find her own successes. Two years of study produced the desired result and Wayne didn’t wait for the ink to dry on his diploma before he headed home. He seldom left its borders again but, on those rare occasions when he did, he counted the days until he returned. He spent the remaining years of his career as the Secretary of Higher Education for the State. Colleagues often asked him why he didn’t pursue greater fame elsewhere. His response was typically Montanan - he might have made more money and enjoyed greater professional accomplishments somewhere else but the cost of leaving this place was a price too high to pay. He lost his daughter, Heather, to breast cancer in 2001. It was truly the greatest loss of his life and his greatest failure and it changed him forever. He was forced to realize that he couldn’t fix everything - strategy and planning didn’t work, anger didn’t work and force of personality didn’t work. Heather did give him one parting gift with a granddaughter Abby who grew up to prove that it doesn’t take a mother’s presence to instill her traits in her daughter. Abby’s gift to all of us are the earie reminders of her mother. Along with Bruce’s three children, Amber, Brad, and Connor he was a passable grandfather. Distance and time precluded attending dance recitals and football games but he was extremely proud of them and loved them all. Bruce’s wife Melissa became not only a daughter-in-law but a true friend as well. He was captivated by her personality and perplexed by her ability to “hold her own” with him. When he married Carol in 2017 he inherited a feisty daughter, Misty, along with her husband “Bunny Man” Dan and another granddaughter, Taylor, and two grandsons, Evan and Matthew whom he claimed as his own and loved them all deeply. Carol walked the final mile with Wayne. He once said that she was willing to do everything he wanted to and most times did it better. She held his hand for 25 years – sometimes gently and sometimes like a vice while he kicked and screamed like a 5 year-old in Walmart. He played his Martin and sang her songs and she gave a lot and she put up with a lot and Wayne loved her for all of it. Services will be held at The Lake Funeral Home (101 Sixth Ave. East in Polson) on February 1, 2019 at 10:00 am. We will celebrate his life at the Perfect Shot Tavern (218 Main ST. Polson) after services. Messages of condolences maybe shared with the family online at www.thelakefuneralhomeandcrematory.com. Arrangements are under the care of The Lake Funeral Home and Crematory.